The rumors are true—XTR will now come in an electronic Di2 version similar to what Shimano has on its high-end road groups. Shimano released details of a new electronic XTR component group today, officially confirming rumors that have been swirling for months. Just weeks after announcing their mechanical M9000 high-end cross country group’s migration to 11-speed shifting, the Japanese juggernaut has introduced a Di2 digital platform for mountain bikes based on the same architecture it developed for road groups over the past five seasons. XTR M9050 Di2, as it’s officially called, consists of digital shift levers, front and rear derailleurs, computer displays and batteries that integrate with elements of the aforementioned M9000 11-speed mechanical group. As with the road groups, electricity and data are transmitted via Shimano’s E-tube electronic wiring system. The system can also be configured to control and power FOX’s iCD electronic forks and shocks. ‏Without the linear constraints of mechanical systems, Di2 allows riders to configure shifting for manual gear changes in either single- or multi-shift modes, as well as for two custom pre-mapped shift sequences via the Shimano Synchronized Shift programming mode. ‏The manual single- and multi-shift modes are fairly straight forward. Albeit faster, single-shift emulates traditional mechanical shifting, changing gears one at a time with the press of a button. In multi-shift, holding down the button jumps the chain up or down several gears at a time. Shimano says multi-shift can “dump” a whole cassette’s worth of gears faster than could be done with mechanical systems. ‏Shimano Synchronized Shifting—Synchro for short—allows users to program custom gear sequences based on personal preferences. For instance, most people try to avoid cross-chaining and avoid using the rear cassette’s largest few cogs when they’re in the big chainring. With Synchro, mapping can be set to automatically shift into a more-sensible next gear that doesn’t cross-chain—say downshifting the front ring while upshift the rear derailleur to the next lowest gear ratio—as the sequential step when they get to that cross-chain gear. Video: This video helps visualize Synchro Shift and its associated gear ratios for 2x and 3x setups. ‏With the Synchro’s two programs, you can set up condition-specific gearing maps—say Synchro #1 for a course with a lot of climbing, and Synchro #2 for a more flat terrain profile. Toggling between the two Synchro programs and manual setting requires a few button presses and can be done on the fly. ‏The system actually emits an audible alarm to foretell impending front shifts which riders can preempt by toggling to manual mode. ‏Using Synchronized Shift only requires one shifter, leaving the other available to control compatible FOX iCD suspension products. ‏The aforementioned gear controls—dubbed XTR Di2 FIREBOLT shifters—feature ergonomically developed short-stroke switches that mimic the tactility of their mechanical counterparts, but feature lighter action. Because they don’t require mechanical leverage, the radial shifter pods are much smaller than mechanicals and the shifters take up less handlebar real estate. 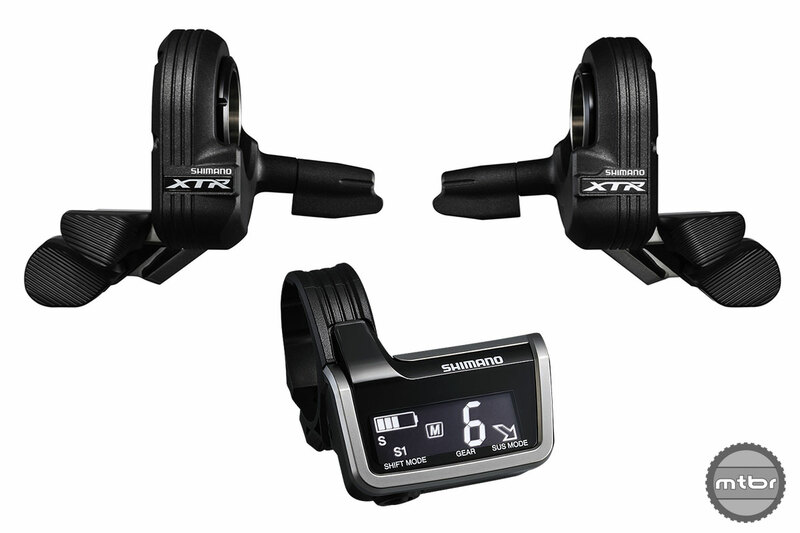 Shimano designed the shifter units to be actuated with either a push-push or push-pull motion. Complementing the controls is a small head unit plainly called the SC-M9050 Display Unit, which allows monitoring of Di2 data like gear selection, battery level and shift mode. It can also display suspension data for the FOX iCD system, acts as a junction for E-tube wiring, and hosts the system’s power input port for charging. 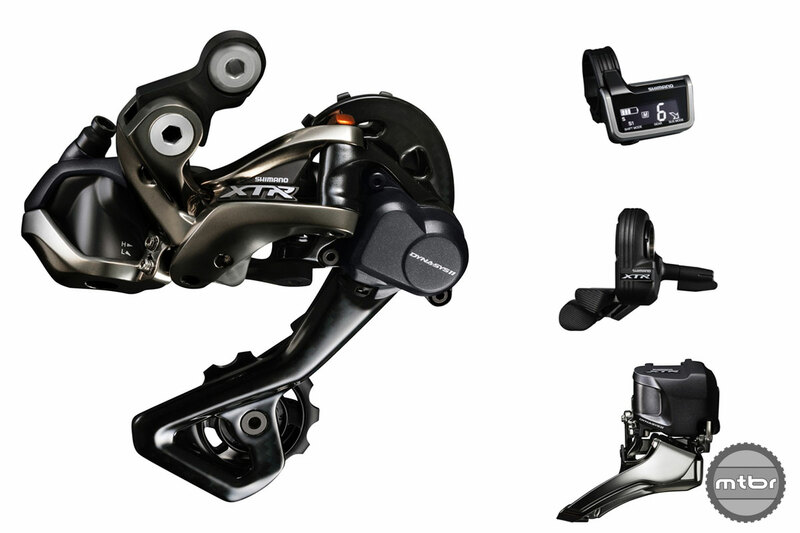 The XTR Di2 shifters can run gear selection in a number of modes as well as control suspension settings. A head unit display helps you keep tabs with what’s going on. interesting that the FD is a “conventional” swing, not the new side-swing motion. Joules, Good eye. The primary reason for going with side swing on the new XTR mechanical was moving the mechanism from behind the seatpost to create more clearance back there. The mechanism and motor for the Di2 FD is already out of the way, so there was really no reason to make it side swing. Awesome ! I’m not a fan of putting electronics on my bike but I can compromise my principles for perfect shifting. Thank you Shimano for maintaining a true gear range, out here in Washington I have a name for people running 1* drivetrains,,,,, walkers ! In the world of doping an cheating, what is preventing someone from hacking into another pro’s team bike while racing for their team’s gain? Your question makes little sense…it’s not as if bikes drivetrain controls are in the cloud or something. Di2 has no more or less opportunity for sabotage than any other bike part. Am I the only one who actually enjoys the feeling of mechanical shifting? …I guess will have a better oppinion after trying the stuff, but feels like part of the fun will be stripped out. Communication between components still remains to be seen, one unresponsive shift will be enough to want to throw the kit in the garbage can ….be sure to throw spare batteries (along with gopro and cell phone’s) in your cammelback! Shimano, I waited patiently for your 11spd offering very much hoping that it would be competitive with SRAM. It’s not, the range IS too small. You guys don’t get it, it’s not about what you think is good for me but rather what I, the consumer, want to buy and I’m not the only one. The comments are particularly bothersome since you guys think 3×11 is a good idea? I like all my other Shimano parts! Who exactly is asking for this? Probably no one, but they make it and therefore must think it’ll sell? How many gears can you shift with one push of the lever? It looks like you can only change one gear at a time. Old XTR lets you do 4 in one direction and 2 in the other depending on how far you push the lever. Is wireless shifting going to be the next step? Oh! I Know! Shimano should not only integrate automatic shifting, but also some type of motor to assist with steeper terrain. You know, so mtb is not so hard! Slap some power disc brakes on there while they’re at it. In all seriousness I love technology and advancement, however at what point do we stop calling these ‘things’ bicycles? I feel like the whole technology pursuit in mtb is trying to make it easier, which is counter productive as to why all of us probably enjoy it. Because if we didn’t enjoy it; we’d be riding say, a dirt bike. Just curious, is this bluetooth or some other wireless and what’s the possibility of interference/hijacking…..
Say, for instance, someone is using it to race and an opposing team wants an advantage……..
It’s not wireless! There can be no hacking or interference. There are wires connecting everything. Most car’s on the road today are DBW (drive by wire) throttle controlled.. Most people can’t even tell and this was phased in under everybodies noses except the people working on them or till there is a problem..
this is just a step in evolution and is just the natural course..
Me I just stick to the old fashioned stuff but if I was given a setup for free I certainly would use it..
Nice but the author doesn’t understand the difference between compliment and complement. On the contrary, he does indeed know the difference, but because it wasn’t flagged as a misspelling, it went unnoticed. Thankfully we have eagle-eyed readers like you. Thanks! Why is Shimano wasting their time and our time? Internal gearboxes are the future. Shimano; make a bold step and stop slowing down progress. I find the idea of a computer deciding which gear combination is best so hard to grasp, especially with mountain biking. When I’m standing up, grinding up a steep hill, and I want to shift up or down a couple of gears, I know not to touch the front derailleur since these notoriously do not shift well under high load. Can this system make that judgement call even if it is mechanically less efficient? I can already imagine the cursing that would follow the ‘grind, grind, grind” noise when the computer decides to try to shift chain rings for you at the most critical moment. James- The computer doesn’t decide the gear ratio, nor when to shift. It lets you pre-program sequences (ratios) of shifts that you activate using the shift buttons. It also allows you to opt out of the program mode (called Synchro Shift) and into manual, one-gear-at-a-time mode at any point. Maybe people need more pictures because they seem to not be able to read and/or comprehend the articles. Make them like the safety diagrams on airplanes. I find this quite interesting. If all shifting can be linearly (or even non linearly) controlled by one shifter, and the derailleurs are always positioned perfectly over the cogs, this could have better performance than 1x SRAM mechanical. Guys. Before you get on the board with silly questions/objections how about reading about the product, like, at all? 1. Battery life is 600-1500 miles (same as Dura Ace), and if it does somehow run out the mech stays where it was. You can manually move the mech to another gear as well. Charging once a week/month is more than enough for most riders. 2. You can’t wirelessly ‘hack’ someone’s drivetrain. It’s not wireless. 3. You can dump the entire cassette of gears (even with a 2×11) in one press of the lever, or leave it in single press mode. 4. Julien Absalon took first at Ablstadt WC XCO with XTR Di2 in a 1×11 configuration. It has enough range, and if you don’t think it does, your fitness is likely the problem. If it’s not enough range for you, run a 2×11. The front shifting is bulletproof and faster than ever, though slightly less fashionable. Bring on the change. My thumbs and index were getting tired of all that hard work. Running SRAM 1×11 and a Thomson dropper post, my bike has only two cables and they rarely cause a problem. Maybe that’s because I live in a bike-friendly environment (SE Queensland, Australia) and keep up my maintenance. It seems to me we replaced cables with electronics and electric motors in stuff like heater controls on cars a few years back, and that hasn’t really gone too well. Less reliability, massive increases in repair costs, etc. If it ain’t broke ……. “Shimano says multi-shift can “dump” a whole cassette’s worth of gears faster than could be done with mechanical systems.” Looking forward to this statement being verified! The mtbr forums…ahhh…always good for a laugh for all the ignorant questions and dumb comments. Thank you. Looks like apretty fancy gadget to add more complexity and cost. But I like the way it works. It will probably be available on $6K bikes. I wonder what it would cost as an accessory. I’m curious from the point of view of a bike shop mechanic. Does Shimano provide clinics or trainings if your shop specs bikes with the new technology? Is this a welcome development, etc? Shimano does classes, online and event sessions. Shops serious about Di2 have a wealth of options available to them. All very interesting, but proof will be in the riding. As BBBBBBB (?) says above, Absalon rode XTR Di2 to victory at last weekend’s XCO World Cup race at Albstadt. In fact, there were three riders using the new drivetrain, and two of them were on the podium (Absalon and Giger). The third tester (McConnell) took 6th place. Not bad for the first use in a race! It is ridiculous how little attention these amazing XC races get in this country. I would get the 3×11 just to irritate my singlespeed friends. But for advanced mountain bikers, they should already know the technique to shift their bikes and at which point they need to shift it…. I had many friends do not understand how gearing works…This technology can help them in riding..But still, not in their knowledge. I ride my bike to escape the digital world. Will this system work with just a rear mech? My wife is arthritic and my find this system better. She doesn’t need a massive gear ration so a rear mech only may be the answer.